Well, where to start…I’m 26 years old and I have my own videography and editing business. I was diagnosed with CF at birth and I have an older brother, Patrick, who had CF. Along with Pat I have a younger brother, Greg, and an older sister, Kelly. I’ve always been known as the goof ball of the family and I always try to keep everyone laughing wherever I go. Throughout my life I have always been an active person. Whether it was running around with my friends, playing various sports such as baseball and soccer or skateboarding, I always made sure that I kept moving. After my college graduation in 2012, I ran a Spartan Race with some friends as an end of college challenge and I loved it, I was very sore but I definitely loved it. 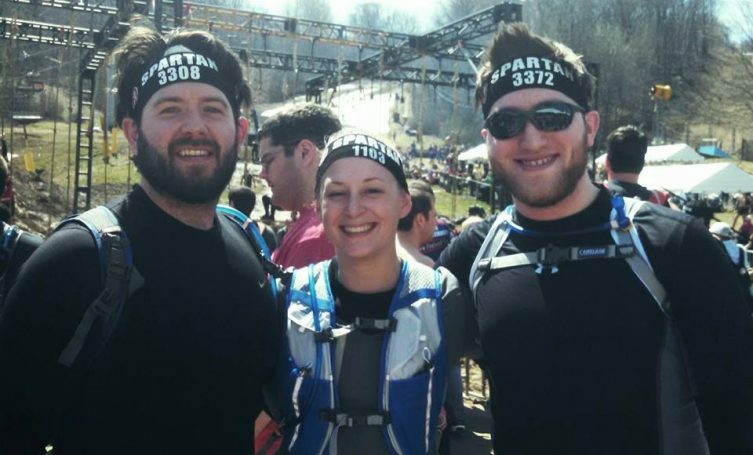 Spartan Races made a reappearance in my life in 2014 when Patrick passed away from CF. I began running the races to honor my brother’s memory and to show others that you don’t have to live in the shadow of CF but rather you can rise above it and live a normal and fulfilling life. Along side of me for these races were The CF Spartans comprised of myself, Patrick’s best friend, Michael and my girlfriend, Victoria. Since 2014 we have ran a total of 15 Spartan Races and earned 4 Spartan Trifectas. I think what motivates me the most is having CF actually. It pushes me to work harder and I know at the end of the day I truly earned every step. My mom used to tell me when I was young that the reason I had CF was because I was strong enough to handle it and that I had it for those who weren’t strong enough; that’s something that has always stuck with me and been a mantra for me to some degree. Along with that, my family and my team helps to motivate me and keep me active, they want to keep me around for a long time and I want to be there for them for as long as possible. Finally, my brother motivates me. He was a very influential part of my life and made me into the person I am today. I exercise so that I can lead a healthy and long life. Being active is incredibly important for everyone but especially CF patients because it keeps everything moving and decreases your risk for illness and infection. I have a lot of plans for my life and I’m not giving up on any of them without a fight. Exercise is such an easy thing to do and it’s benefits are endless; why wouldn’t I exercise?! Eminem has been my go to song for quite some time but the Fall Out Boy songs have been a recent addition to my list. They have a more rock element, which I love because I have been a guitarist for over 10 years. I’ve actually been trying to obtain the rights to use these songs in my documentary about my journey through these races to motivate and amp up the viewers. What advice would you give to someone with CF who wants to start exercising more? My advice would be to get out and do whatever you can, whether it’s a walk around the block or run a marathon every little bit helps. If you set a goal, such as I want to run my town’s annual 5k, then you have something to work toward and you can take the necessary steps to work up to that goal which will make you healthier and implement good habits in your daily life that will benefit you immensely. Secondly, talk to your doctors and work out a plan to meet your fitness goals. They want you to be active too and they’ll help you be able to reach your potential. Get up, get moving and start breathing!